Where to start? Back in 2000 I got the bright idea to start building a site called XboxAddict.com. It quickly became one of the top Xbox fan sites in the world. I got to know the "ins" and "outs" of the modern gaming industry. Although I still love everything Xbox in May of 2015, I decided to walk away from the site after 15 years! 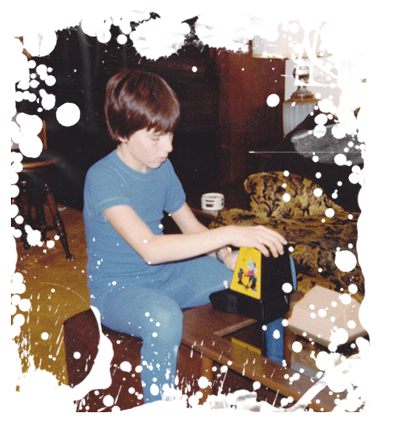 I had this "never-say-die" love for my first gaming console - The Colecovision. I have many fond memories. I sadly don't have a photo of my brother and I playing it. Why did I build this site? Pure frustration! When it came time to find general information on the classic machine. It was sadly in too many different places, and very frustrating to muscle through. So, I thought as a graphic designer and web developer...the idea. Colecovision Addict.com - How original...Right? Putting together this site has been/is a lot of work. From fixing cracked thirty year old box art, to compiling the data from various programmers, publishers, forums such as Atariage....AND downloading screenshots from various sources or even generating my own. Call me ambitious, but I also (over and above everything else) wanted the site to be easily accessible on my smart phone. Plus, you won't find Atari, Odyssey, Fairchild Channel F, or even Adam stuff here, only Colecovision. Sorry guys. Ultimately, my end goal is to help others find and promote new homebrew Colecovision games. For newcomers and veterans alike, and to have all the information right here. Stay tuned for more features coming to the site. If you want to get in touch with me, I'm known on AtariAge as Kamshaft, @therealkamshaft on twitter or add me to to facebook (see sig)! See you around!